For the past time I have been enrolled in Xamarin University with as main goal to verify if the knowledge I had gained by learning myself was the right way. And of course, while I’m at it get certified in the process. In this post I would like to tell you about my experience with University and how you can get started today as well! Not a very technical post this time, so skip this one if you’re looking for that! Let’s get something out of the way immediately; Xamarin University is awesome, a bit expensive at about 1800 dollars per year if you are a one-man developer, but awesome. If you’re used to a Pluralsight, Channel 9 or even YouTube then you’re om for a treat! Xamarin University is not just static videos which you can watch and skip you as you like – although they are available! – they are actual live classes! With actual instructors and the opportunity to ask questions etc. So that is really great! This also allows for some cool interactions, some instructors start off by greeting everyone and checking where everyone is from and also be prepared for flash quizes! Almost all classes have some individual of class exercises so you get the hang of the subject right away instead of just listening passively. Besides that you can watch back the videos, do some self-guided classes (with the same flash quizes and exercises) and.. GET CERTIFIED! Another caveat of this method is that attendance is required for the classes that are required for certification. You cannot start the exam until you have attended all of the mandatory classes. Which are awesome, so no worries there! Once you have signed up, the first thing you need to do is specify the times you are available for classes. If you’re in Europe, like me, then some time slots aren’t ideal. But hey, they try their best! And if you really can’t find any suitable time slot you can request a separate session which does suit you. Keeping this in mind it might take you a while to follow all the courses you want, unless you are willing to follow classes which happen in the middle of the night local time. Then when you look around you have several pages to point you in the right direction depending on what you main goal is. Also there are some classes which are recommended to follow first. One that is more or less mandatory is the ‘Orientation and Welcome [XAM101]’. This explains all basics kind of like I’m doing now! These are all separate tracks. Or some of them can be combined to a track to achieve some goal like certification. The number behind it tells you something about the expert level. I’m not sure on the details, but as a general rule: the higher the number, the more guru you need to be to understand it. In the below graphic you can see the recommended path to certification. Per track you can see what classes are available, which you have already completed and which is recommended next. The latter can also be found at more places along with the information on which times the class is available next and the ability to sign up for that specific class right away! Underneath you can see an example of that. Here are the Self-Guided Learning classes again, they are very great! They can serve as a replacement session for an actual instructor session. So if you cannot find a suitable time or feel confident enough about a certain subject you can check out the Self-Guided class and go through it in your own time at your own pace. And the awesome thing is that it also counts as a completed class! So with this you can even achieve your goal faster! Basically all pages in here are a different view for the same thing; what classes are upcoming? What classes have you planned/done already? How far along are you on a certain track? Etc. That last bit is a nice one, they’ve added some gamification to it. And damn it, I am a sucker for it, wanting to fill up all those progress bars. This gives you a direct overview of how far along you are on all subjects. Of course there is no restrictions on how often you follow one class and each class has a recorded session as well if things went a little too fast for you. Note: watching (back) a video doesn’t count as attending the class. Ok great, but how about that certification? Woops, sorry, lost track there. So, certification! As I have mentioned; there are 15 classes you need to follow before having a try at the certification exam. 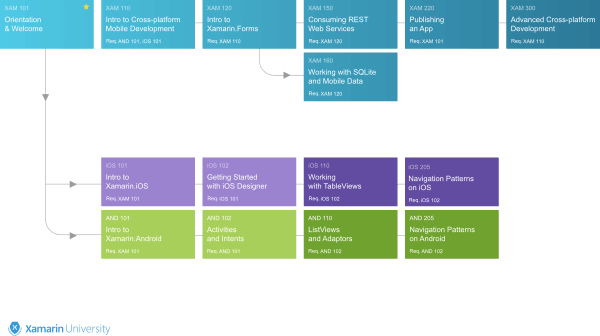 This should take you about 4 months if you’re a starting Xamarin developer. If you already have some experience, no worries, there are a couple of things you can do to get to the exam faster. First there is the Introductory Assessment Exam. 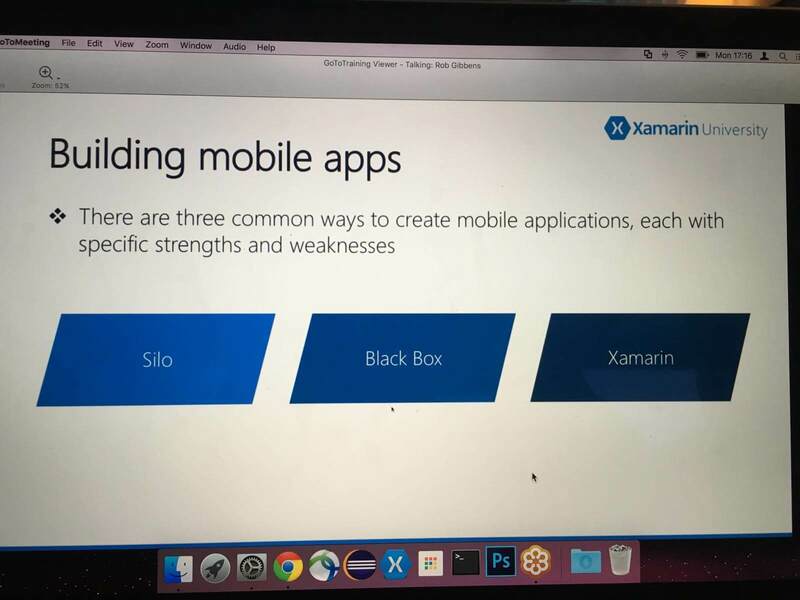 This is a test you can take to prove that you already have (basic) knowledge of Xamarin. If you can pass the test with 80% or more then you can skip 7 (seven!) of the 15 classes, so you’re halfway there already. The test consists of 50 questions for which you have 60 minutes. It certainly is doable, but there are some tricky questions in there, so pay attention! Even more so because you only get one shot. If you don’t make it, no worries, but you’ll have to attend to those 7 classes in order to qualify. Now the classes are awesome! The instructors are even better. They take all the time to explain everything to you, have a lot of patience and all have the own trademark. One asks you where in the world all attendees are from, the other goes through the list and giving everyone the chance to introduce themselves shortly. Classes tend to be about 20-30 persons which also has a bit of a downside. When all mics are unmuted and you are responsible for your own muting, people sometimes forget or people simply just don’t know it because they come in later. So you hear a lot of noise and ‘oops, let me mute the mic of someone coming in’. It isn’t a total disaster, but could be a bit disruptive. He total upside from that is that you can use you mic! And ask everything you like! Which rhymes. With each class comes some materials which usually consists of some code to get you started and a recap of everything that is handled in class. So you’re all excited now and want to check it out for yourself? You can start a trial right here. And you know what’s awesome? All courses you follow here, including the self-guided once, count towards certification already! So try it, and if you like it, sign up when you are ready and pick up right where you left off not losing any time! The rewards in knowledge is great, but check out these these bad boys below. That makes it all worth it right?! 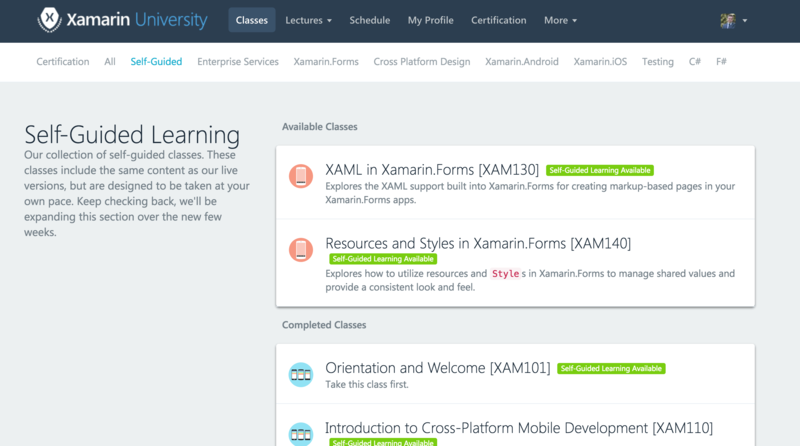 Quickly after certification I have been selected to give an actual guest lecture on Xamarin University! How awesome is that?! From student to tutor! So if you have a University account already, quickly head over there and sign up, it’s on next Tuesday already! I am thinking myself of getting certified in XAM University. 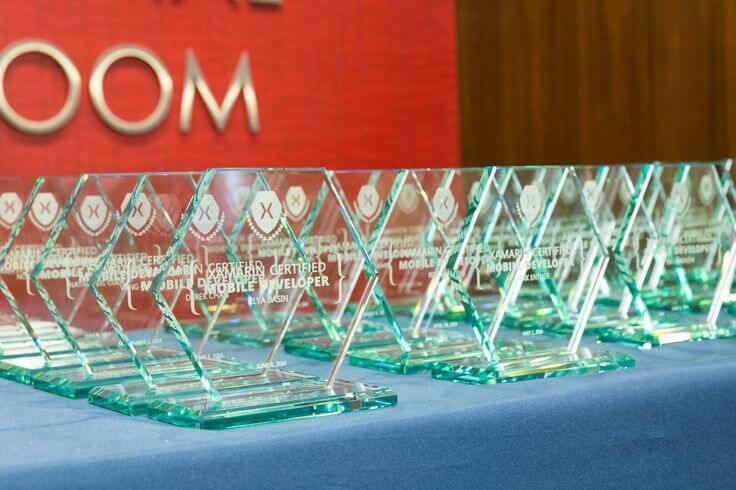 Do you think that a person with WPF (XAML) and Windows Apps Background and little knowledge of Android/IOS development with the willingness to move fully into cross-platform mobile development can pass the final certification exam? I think you sure can! Better yet, I think that is a very good base to start from. You will probably have some trouble adjusting from the WPF XAML to the Xamarin XAML. There is some minor naming differences to make it more intuitive for mobile, but you’ll pick it up fast enough. If you want to speed things up gain some experience first, but that isn’t required. You’ll get some hands-on with the University right away as well. And you can take any class, however often you want so only if you feel you’re ready you can take the final exam. 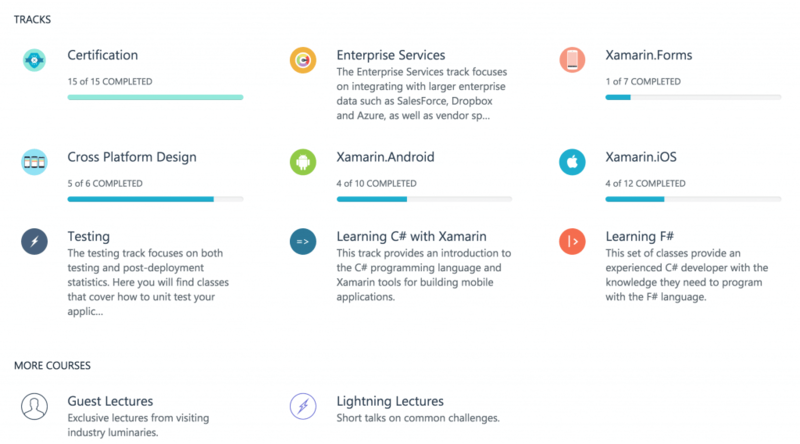 So I understand this courses for certification are basics of Xamarin development for all platforms. I think first I’ll give a shot and try 1 month of free trial. Yes! The sessions are targeting beginning Xamarin developers so you’ll be guided through all the basics and at the end you will be able to develop awesome apps. If I hear what experience you have already, I’m confident you will understand everything fully and will be certified in no time! Just start a trial indeed and check it out, you won’t be disappointed!